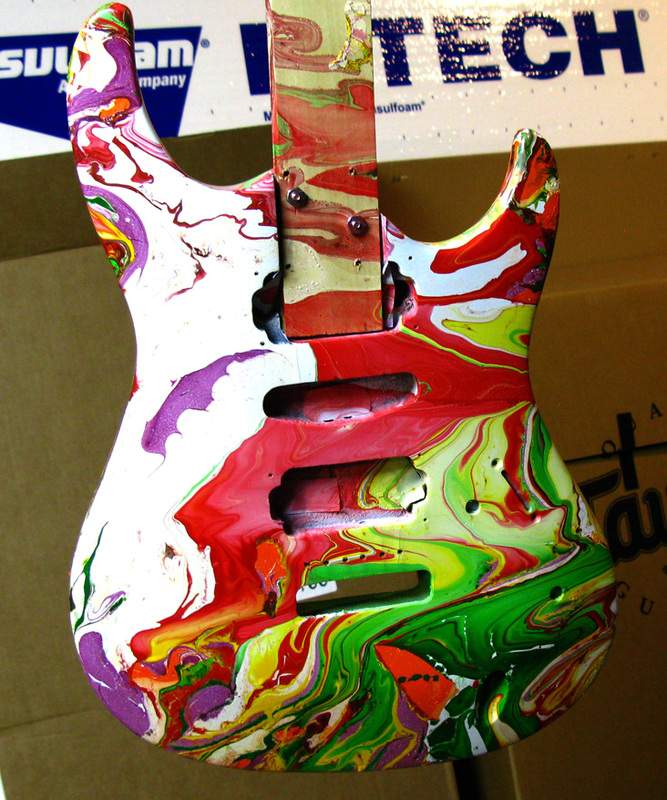 I recently took an interest in “swirl painted” guitars. How on earth do they do that? After a little investigation I decided to try it. 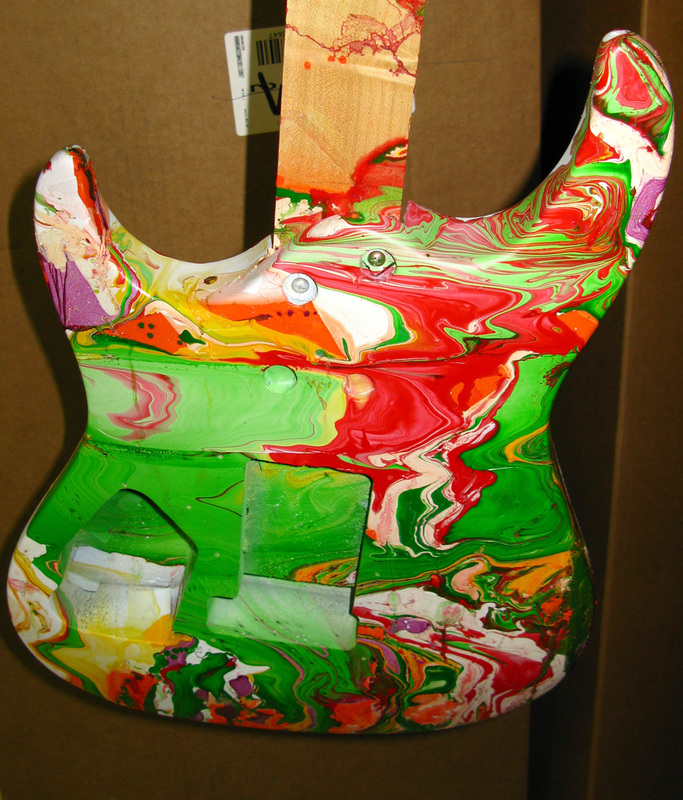 Here is the first guitar I painted. This solid body guitar was a fun project and I think it turned out well. Here are the basic steps. I took the guitar apart, removed the neck and all of the electronics and tuning “machine heads”. I sanded the body flat and added several coats of primer paint. I masked the parts of the body I didn’t want to paint. The fun begins by filling a 40 gallon plastic trash can with water. The water then has to be heated to around 80 degrees (F). I purchased an aquarium heater to heat the water up. I added some Borax (used to condition the surface tension of the water), and then poured in different colors of enamel (the paint used for model airplanes and cars). 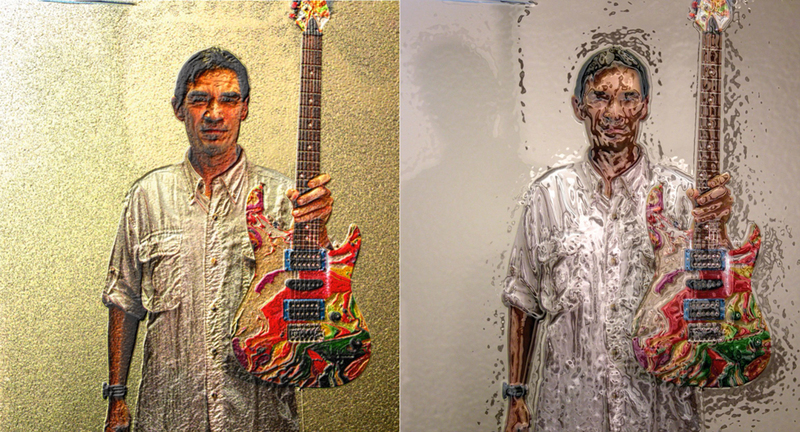 I swirled the paint (on the surface of the water) with a little stick and then slowly submerged the body into the water. Previously I attached a piece of wood to the neck pocket of the guitar body so I could completely submerge it. 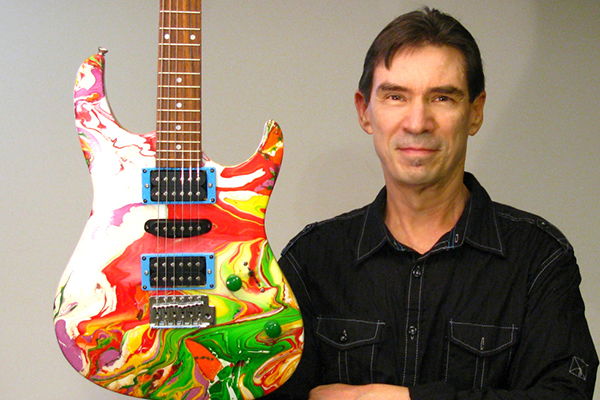 As the guitar goes into the water, the color adheres to the surface in wild “swirls”. 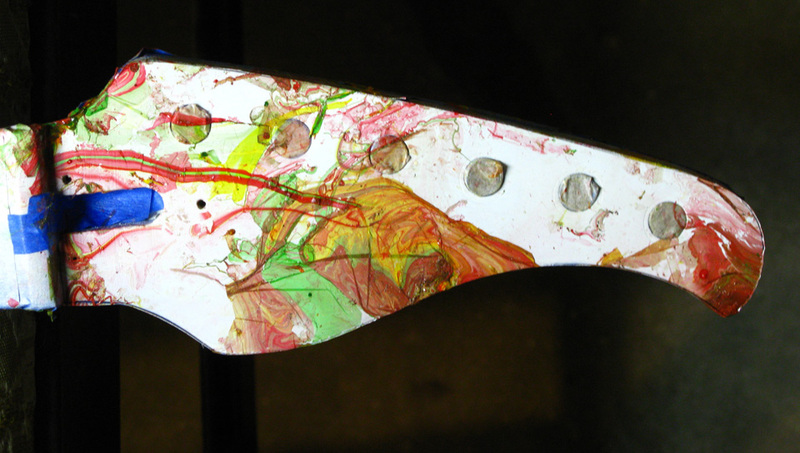 After the guitar was submerged I used paper to push aside any remaining paint on the surface and pulled the guitar out. 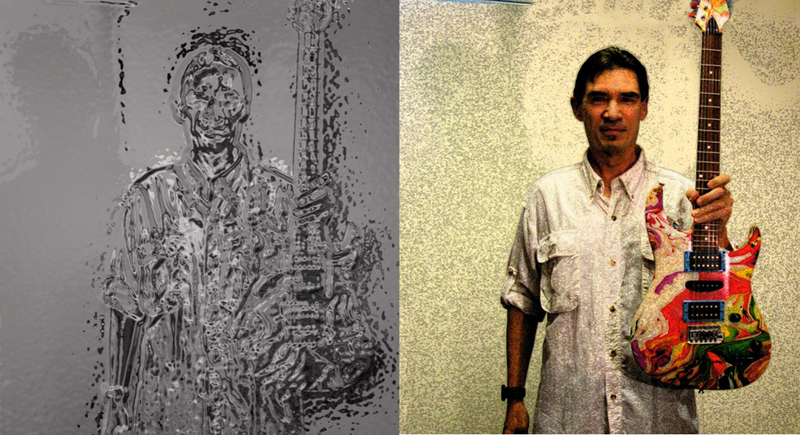 After drying, I applied many clear coats and allowed them to dry for several weeks before reassembling the guitar. Here it is….and it also sounds fantastic. This is right after swirling. This is how the back turned out. 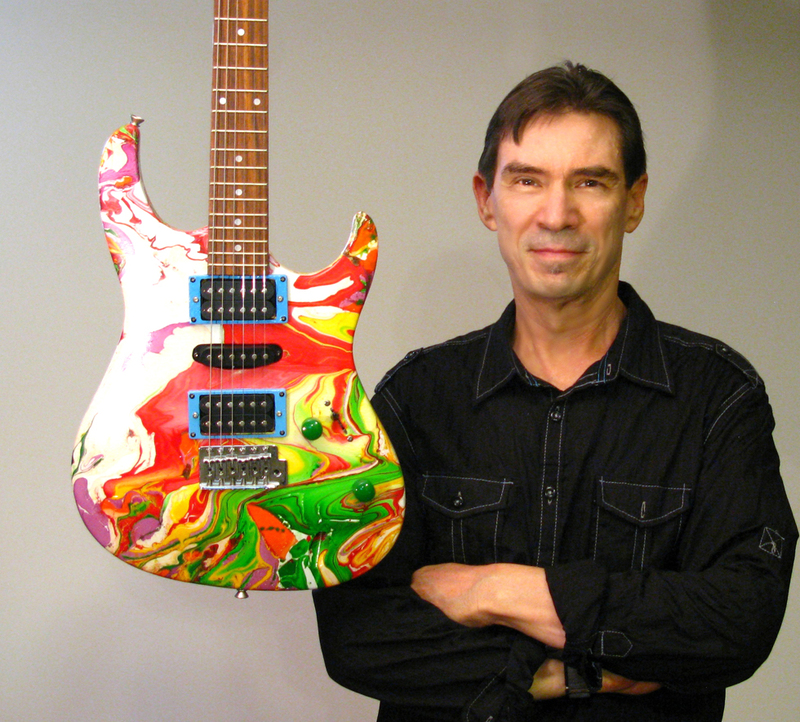 Chuck – That guitar came out looking so cool! Though I’ll leave all that stuff to you. . .
thanks so much Molly it was fun doing it.